Sadio Mane scored on his first Liverpool appearance. It is always important for any team to start the season on a high, especially if you have high hopes for the season ahead. Liverpool are aiming for the stars this season, which means that a good start to the league campaign is essential. With all the signings made by Jurgen Klopp over the summer, the Reds are expected to challenge on all fronts. The fans will be hoping for some long overdue success after years of waiting and build-up. For that, they will need to settle in as quickly as possible. Fortunately, Liverpool has been given a somewhat favourable opening month in the Premier League as they will face the likes of West Ham, Brighton and Crystal Palace. This is the perfect opportunity to get off to a flying start and set the pace for other teams to follow. After such an impressive pre-season, the Reds will want to start well. The start is usually an indicator for the season ahead. It has been so for many clubs in the past. Liverpool has enjoyed their share of impressive opening day performances en route to successful campaigns. Here, we are looking at five of their best. Every single one of these games would set the marker for a positive season for Liverpool as they finished in the top four in all five of these seasons. Here's to hoping that Sunday's Premier League opener goes in a similar way to these fine performances. These are Liverpool's five most memorable victories on the opening day of the Premier League. Building on from reaching the Champions League final in the previous campaign, Rafa Benitez splashed the cash and spent £45 million in strengthening his forward options, with the likes of Fernando Torres, Ryan Babel and Yossi Benayoun. Only Torres would make his debut in this opening day battle at Villa Park. 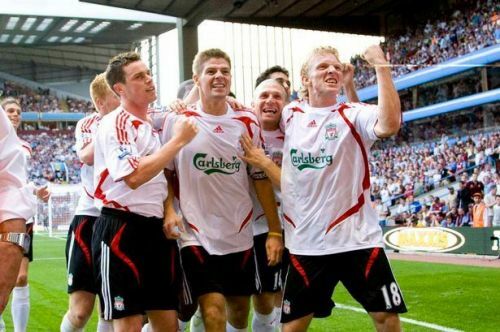 It had been five years since Liverpool last won their opener, funnily the last time they had done so was at Villa Park. The Reds, in their new white away kit, drew first blood thanks to an own goal from Danish defender Martin Laursen. Liverpool were marching towards victory until a Gareth Barry penalty looked to save Villa with less than ten minutes to go. However, the best was yet to come. Steven Gerrard stepped up to belt in a terrific free-kick with around two minutes to go. It was a brilliant goal, one worthy of giving the Reds a big win at the start of the season. 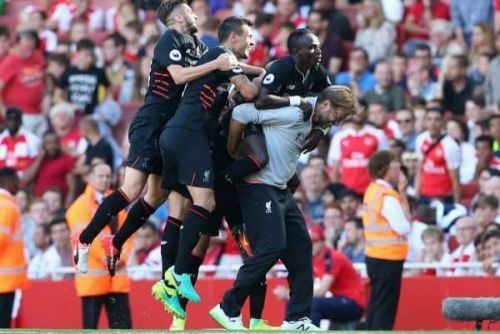 It was a huge boost for the team, who would go on to enjoy an unbeaten start to the season before dropping off from their main rivals. Fourth place with 76 points in the bag is still quite a respectable feat, despite being a step or two below their eventual target.